Tory Folliard presents paintings by Melanie Parke and Mary Jones. Green Door Bouquet by Melanie Parke. Photo courtesy of the Tory Folliard Gallery. “Dew often comes with associations of the daybreak, assumptions of promise, the start of the day; a sense of vibrancy from something so small,” said Parke in her artist’s statement. While some critics have seen the still life as a lesser art form, they have always been popular with buyers. To some, still lifes can appear a bit stodgy and rigid, but Parke’s 15 somewhat abstracted, oil paintings of home interiors, showcasing vermillion, coral and golden flowers, luscious tropical fruits, and exotic birds, feel exciting and tangible. 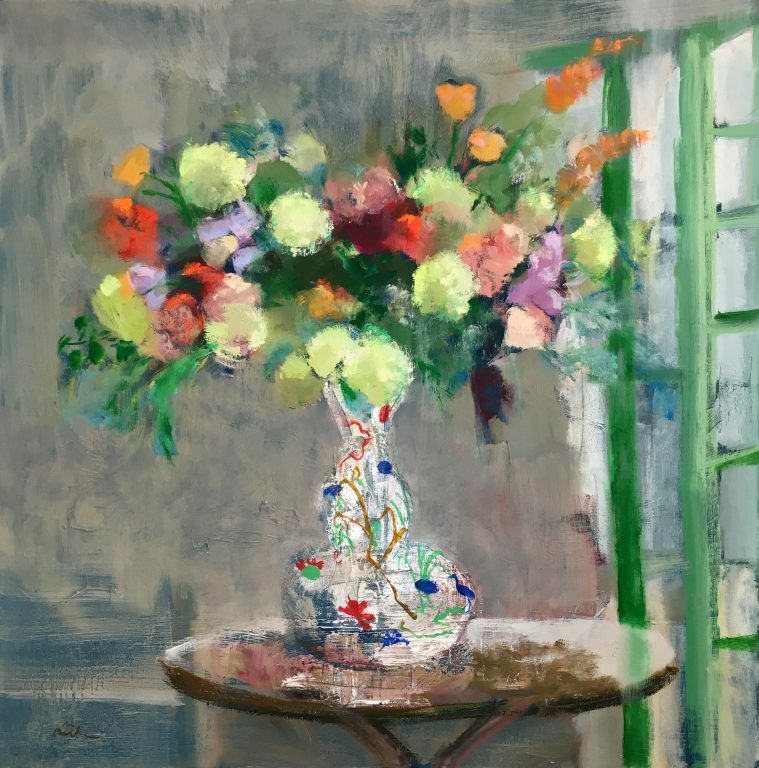 The artist’s brilliantly-hued works echo those of impressionist Henri Matisse and New York artist Eric Aho, known for their vivid use of color. Parke’s paintings, cheery, feminine, and cozily domestic, also transport viewers to breezy Mediterranean cottages and sunny Caribbean beaches, while windows overlook azure water and brightly-painted double doors open to a world of travel and adventure. Born in 1966 in Indianapolis, Parke received her BFA from The School of the Art Institute of Chicago in 1989. She completed two artists’ residencies at the American Academy in Rome, Italy, experiences which are echoed in her lively subjects, painted within tranquil settings. “She is known for these bucolic paintings,” said Tory Folliard assistant director Becca Sidman. Many of Parke’s works are set against muted gray and brown backdrops, contrasting nicely with the objects she has chosen to highlight. The artist seems especially fond of pottery and ceramics, evident in the detailed Asian and Greek-inspired vessels that hold fruits and flowers in paintings like “Green Door Bouquet,” “Stag,” and “Glads and Apples.” Parke also takes special care with room accents in paintings like “Yellow Orchids,” which feature striking blue and white patterned curtains and an artist’s bust. Parke creates lovely, idyllic environments that seem tailor-made for fostering the creative process, encouraging repose and self-reflection— in short, a painting of the perfect artist or writer’s studio. Marchhare by Mary Jones. Photo courtesy of the Tory Folliard Gallery. In her exhibit, “Coddiwompling”(an old English slang word meaning “to move purposefully towards a vague or unknown destination) Mary Jones, creates cartoonish characters inspired by walks with her daughter through their Midwestern neighborhood. In imaginative works like “Lordy Me” and “Erna’s Coat,” figures with absurdly long heads and torsos are positioned against peach, green and purple backdrops, next to outlines of houses drawn with bluish pen and ink, reminiscent of children’s drawings. Some pieces are set against a grid backdrop. “Her work is very playful,” said Sidman. Jones, who received her MFA in printmaking from Indiana University at Bloomington in 1976, often incorporates printed photographs, bits of newspaper, and other written media in her work—perhaps to symbolize physical mementos, or imprints, of her short journeys. Several drawings, among them “Marchhare,” (a reference to Lewis Carroll’s Alice in Wonderland) feature adult and child figures and animals like a white rabbit, while smaller symbols of houses and cut-out bits of paper mingle with stream-of-consciousness text. Her work shows that a sense of curiosity and a fresh perspective can make even the most mundane objects and locations seem intriguing. Melanie Parke’s “Dew” and Mary Jones’ “Coddiwompling” will be on display at the Tory Folliard Gallery, 233 N. Milwaukee St., through April 13.